There was no calendar hopping this year for the Woodrow Wilson Bridge Half Marathon, the first of the region’s races to bear the brunt of the federal government shutdown last year. The race ended up postponed until early November, but temperatures were cooler in the fifth running in 2014, with runners bundled in spandex, hats and gloves in early October. While many weren’t expecting the low temperatures, most runners were thrilled to race in the crisp and cool air so early in the fall. “I don’t think it’s a hyperbole, I think the conditions were pretty perfect,” Kevin Ford said. [button-red url=”http://results.chronotrack.com/event/results/event/event-10571″ target=”_self” position=”left”] Results [/button-red]The race serves as the Visually Impaired National Half Marathon Championship and turned out dozens of visually impaired athletes with the help of guides along their side. Erich Manser traveled all the way from the Boston area to compete in the race. Alex Heiche and Laura Greason, also from the Boston area, helped guide Manser throughout the race. Both were pleasantly surprised with his pace. “Erich gave us quite a challenge today to keep up with him,” Greason said. The race featured generous cash prizes and attracted numerous elites to the field. Bobby Mack, member of the Reebok team, held the lead during the first three miles of the race. “But for a half marathon that doesn’t really mean much,” Mack said. Mack took the lead again near mile seven, but a pack of eight followed close behind and eventually overcame him. Once they reached mile 12, Girma Gebre, Gosa Tefera and Derege Demie broke away. 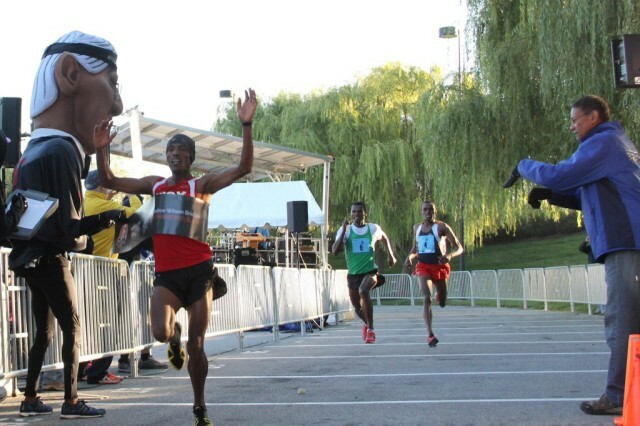 The race came down to seconds, with Gebre breaking the tape at 1:03:50. Tefera finished second with the same tame as Gebre and Demie finished third one second later. Mack said he plans to return to the area in November when he will compete in the .US National Road Racing Championships in Alexandria. The female division also brought out fast elite runners, including Lilian Mariita (first) and Etaferahu Temesgen (second). The two held an impressive five-minute lead over the rest of the pack. Mariita crossed the line at 1:12:33 and Temesgen at 1:12:44. Joyce Kandie was the next female to come through with a time of 1:17:31. The 13.1-mile course started in Mt. Vernon then headed north on the George Washington Parkway toward Alexandria, where runners were greeted with lots of crowd support. Then they crossed the Woodrow Wilson Bridge (as the name of the race suggests), which stretches out more than a mile and includes several rolling hills. Roberto Rodriguez, who has run with DC Road Runners for 35 years, said this year’s race marked his fifth time crossing the bridge. Rodriguez also competed in last year’s race in November. Some runners chose to defer their registrations a year after the race announced the new date, including Mark Njore of Dumfries, Va. But by waiting a year, his friend Francis Agula was able to joined him in this year’s race. The race seemed to attract many first-time half marathon finishers, including Alyssa Rucker who crossed the finish line with a Lack Braddock Cross Country shirt. Rucker said she picked a weekend that her cross country team didn’t have any meets to run a half marathon. Rucker said she’ll eventually complete a marathon but probably not for a couple of years. “Hopefully sometime when I’m an adult,” she said.